Flint, Michigan — Brenda Brown, 61, is not a woman of confrontation. Her voice is soft and never rises above a certain volume. She has a way of speaking with a continuous smile that immediately puts a person at ease. Though she is not one for confrontation, make no mistake about it: She is a fighter. You see, Brenda Brown died two years ago. But, she fought her way back — surviving Sudden Cardiac Arrest in August 2016 and becoming a strong voice to educate others about the medical condition. The Brenda before is a twin and one of 11 siblings. She was born in Flint and moved to Otisville as a child. There, she and her siblings attended LakeVille Community Schools. After graduating high school, Brown embarked on an encompassing professional and academic career that would bring her back to the Flint area. After earning degrees from Hillsdale College, Central Michigan University, Baker College, and Capella University, Brown immersed herself in Flint’s post-graduate scene as the coordinator of the Academic Resource Center at Baker College. She was a mother of three and loved her job. She woke up each morning, went to work, and never much thought about what what could happen to her life or death. On Aug. 14, 2016, Brenda’s world changed. Brenda Brown works to raise awareness of Sudden Cardiac Arrest. She had been training to walk in the Crim 10-mile race. There was just two more weeks until the big race. She joined the swarms of people that celebrate the annual painting of the blue line that marks the 10-mile route by walking or running the freshly painted course. She had previously dodged heart failure in 2007, but she underwent surgery, recovered, and was healthy — fit to walk and ready to celebrate her health. She, like many Crim athletes, dreaded as each step took her closer and closer to the Bradley Hills — a series of steep inclines on Bradley Avenue at about the 5-mile mark. Brown knew her hard work was paying off. She walked the hills with no trouble and excitedly called her son to celebrate. The hard part was over. The biggest obstacles were behind her and she knew she still had enough energy to walk the rest of the distance. Brown didn’t recognize that by mile 7 in the Woodcroft neighborhood, she was beginning to act out of character. Benita Seales, 56, saw Brown begin to stumble after the 8 mile mark. She was just shy of the 9-mile mark of her walk. Brown doesn’t remember anything about Aug. 14, 2016. She’s been able to piece together the details from family, friends, and witnesses like Seales. 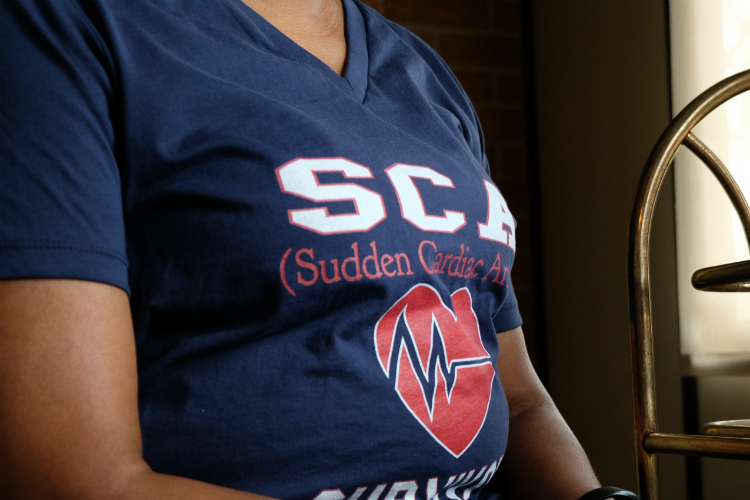 She knows now that she collapsed after experiencing a spontaneous heart condition called Sudden Cardiac Arrest, also called SCA. It caused her heart to stop. Completely. In an instant. She collapsed to the ground, motionless. She lost consciousness before she hit the ground and did nothing to brace for impact, smashing her face against the pavement. Brown explains now, to anyone and everyone who will listen, that SCA is different from a heart attack. It is more an electrical problem than a plumbing problem, she says. And, more immediate. The neurons in the mind misfire and tell the heart to stop beating instantly. The causes are unknown. “(Doctors) did not expect for me to survive, which it still freaks me out sometimes,” Brown says. Amidst frantic assistance and chest compressions by fellow racers, an ambulance was called and Brown was taken to Hurley Medical Center. Family was called and the waiting game began. Then the healing and recovery began. She had a defibrillator implanted so that if her heart ever stops again it can be automatically given an electric shock to restart it. And, less than three months later, she returned to the Crim course and she walked the remainder of that 10-mile trek. Life had forever changed for Brown. Because of her condition, Brown was advised by her doctor to go on disability leave in June 2018. Now, Brown is dedicating even more time to educating people about SCA — including writing a book about her experience — and living her life, every day, knowing she could have a recurrence. Even with a defibrillator, there remains real risk — primarily because the only way to test if the defibrillator really works is by having another cardiac arrest. Still, Brown always takes certain precautions. She keeps her iPhone location on at all times and makes sure the moments she is alone are far and few in between. She now shares her home on Flint’s southside with her daughter and granddaughter. There she busies herself by preparing lessons for Sunday school classes at Prince Of Peace Baptist Church and spends four hours a day devoted to her book. Aptly titled, “The Day I Forgot But Will Always Remember,” the book is about healing, creating a better understanding of SCA, and life for its survivors. “It is also my reminder that my near-death experience is not the end of life but a new beginning,” she says.